Conversion Analysis: Why Do Websites Make Customers Nervous? Three times in the past week, I have tried to make a purchase from a (big important secure) website, and every time, the site makes me feel like they couldn’t understand my goals. The first site was iTunes. 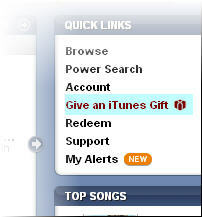 I wanted to buy a gift certificate, and so went right into my own iTunes setup and choose Give an iTunes gift from the iTunes store. But in the shopping cart, they made me sign in. Hmm, I thought, do they think I am buying something for myself? Are they going to charge my personal credit card, when I need to use a different card? And shouldn’t my grandmother be able to make this purchase without owning her own copy of iTunes? So I went to the Apple site and succeeded in purchasing a cerfticate there — but all they needed to say was, please sign in and you will get a chance to choose a credit card. The third one was PR-Web. I used to do a lot of work with them and for whatever reason, haven’t lately. Maybe their interface has changed and maybe I just don’t remember it, but once again, they made me do things in the “wrong” order without giving me any reassurance. In this case, they insisted on taking all my credit card information without telling me that “On the the next screen, you will have a chance to upload your press release.” I finally just did it in their backward manner because they do tell the customer that s/he can give them funds to sit there unused (like a no-interest checking account) — I figured I’d have a way to use the money even if I didn’t get a screen for the press release. Just think – all I wanted was a little reassurance.